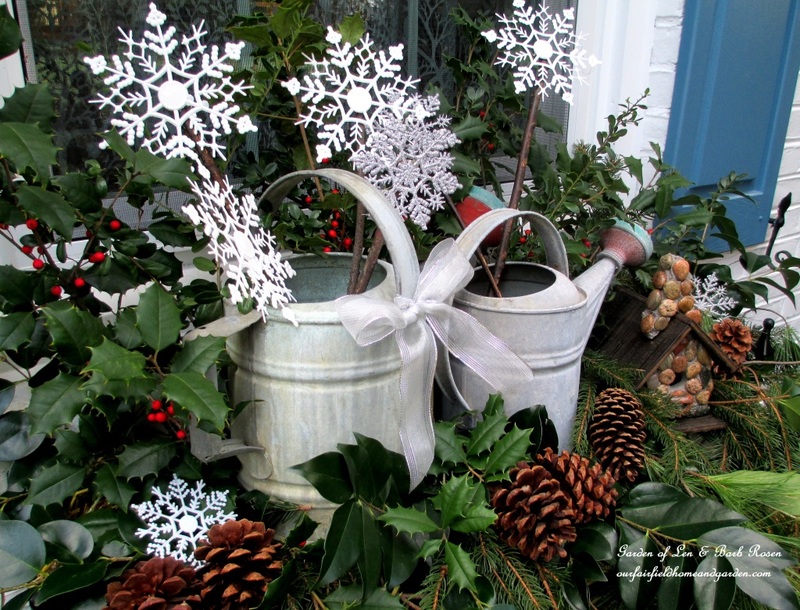 Using watering cans collected over the years, greens cut from our trees and shrubs and some little Dollar Store snowflakes, I put together our rustic winter windowboxes in about an hour. 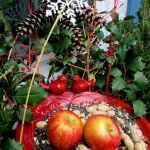 Because I am such an avid gardener, these winter displays suit me well and can stay up until spring (or until I get bored, whichever comes first!). Even though I tried out red-checked ribbon, I settled on silver. Which do you prefer? All through the year, my husband and I pick up interesting items at estate and yard sales. This little stone birdhouse cost just $4 and I couldn’t leave it behind. So glad I didn’t as it is the perfect addition to this rustic windowbox! 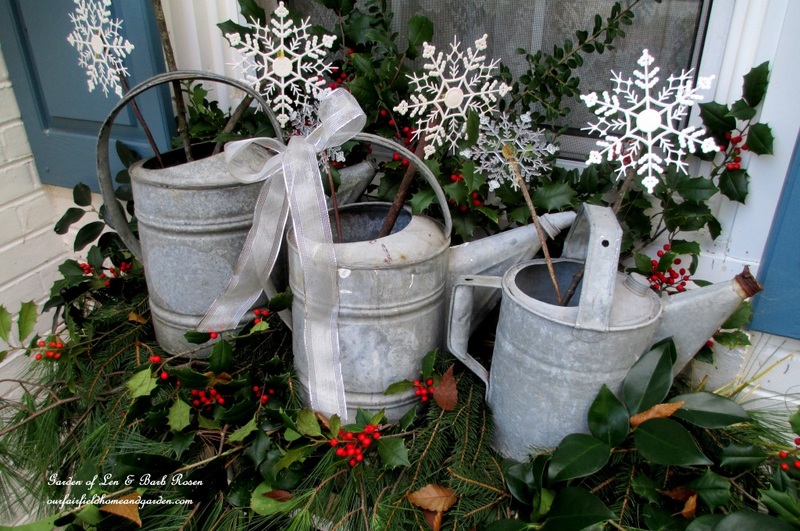 A trio of old galvanized cans dulled to a soft silver fill one of our front windowboxes. Greens gathered from around our property provide the backdrop. Little Dollar Store snowflakes hot glued on sticks add a holiday accent. 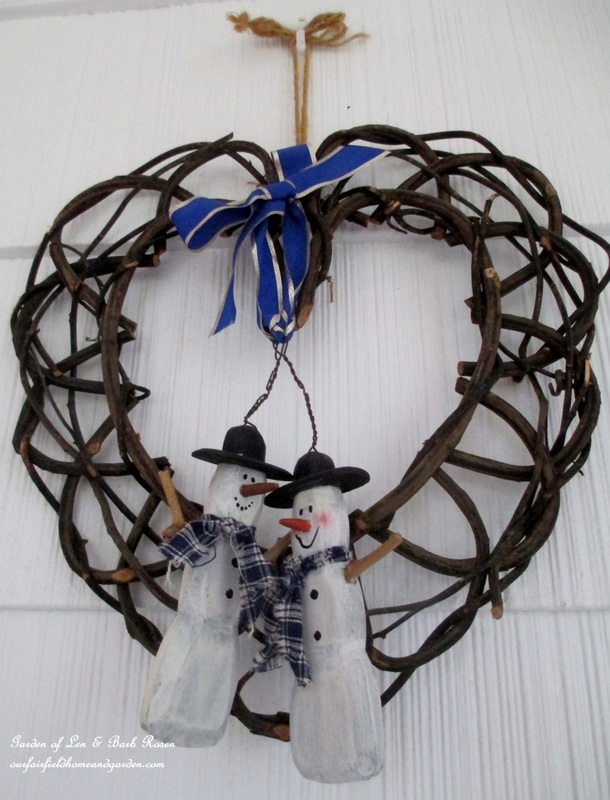 A woven heart wreath picked up at a yard sale is transformed with two little carved snowmen from a craft show. On the front porch, their happy little faces will welcome our guests this season. I placed a large container on either side of the driveway this past summer. They bloomed beautifully with mandevilla until the cold weather started. Then, it was pumpkins and hay and bittersweet for fall. Now, they are planted with tulips, narcissus and miniature daffodils and topped off with greens collected on our property. Red twig dogwood and holly provide color as white pine drapes over the urn edges. Hopefully, the holly will slow down any squirrels looking for a snack! 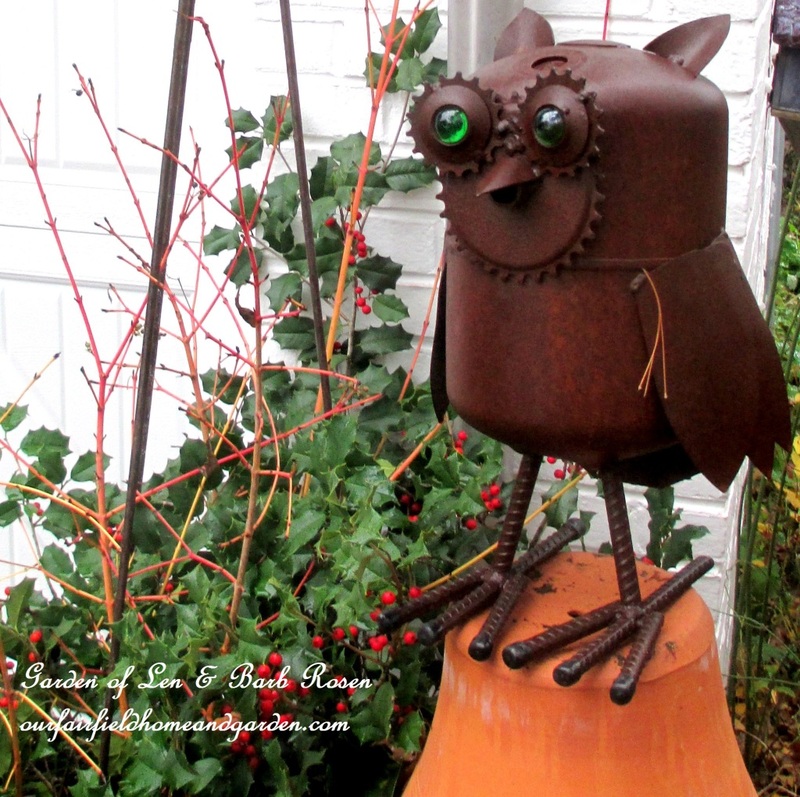 If not, perhaps this metal owl will give them pause! 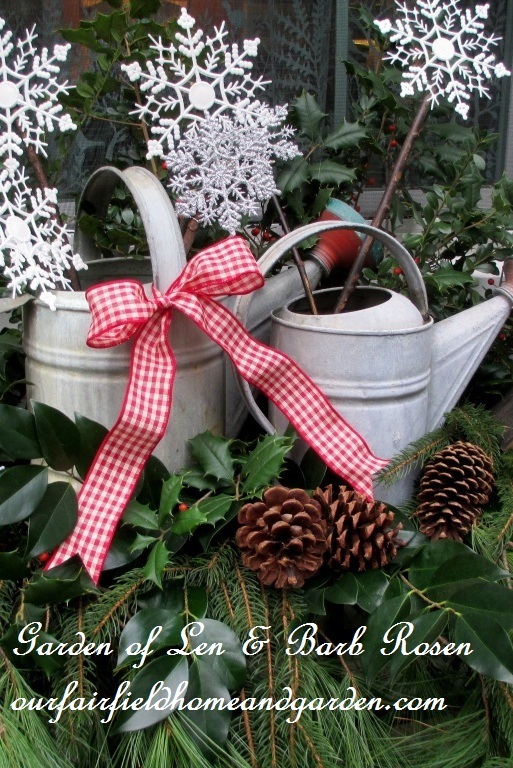 Rustic Watering Cans Windowbox ~ a windowbox theme that will last all winter using what you have! 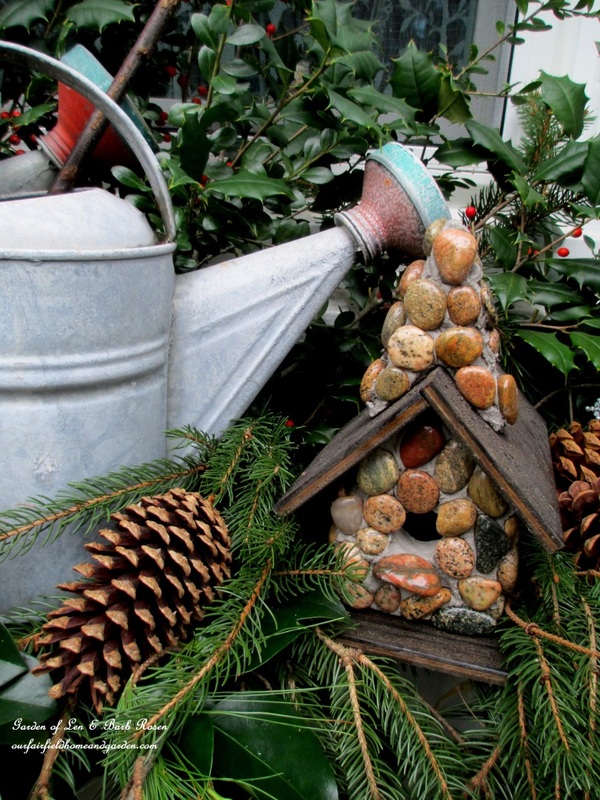 If you enjoyed this winter decorating, take a peek at some of Our Fairfield Home and Garden’s past ideas! This is so neat! I’m all in on vintage finds. You and me both, Shannon! I love the old, the rusty and the crusty! I vote for the red checked ribbon…cheerful and Christmasy! It is very “holiday” isn’t it, Lois? Thanks for stopping by! So pretty! I have a few window boxes that need decorating and this is a great inspiration! Thanks, DeDe! 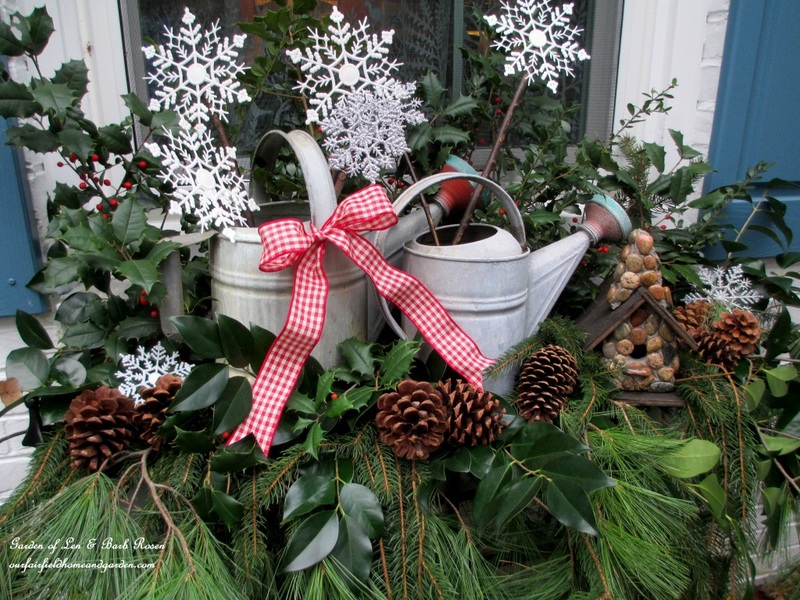 Windowboxes are a way for us all to keep our outdoor decor looking good in the winter! Love the rustic watering can window boxes! Thanks very much for coming by and taking a look at them, Leslie! Thanks for swinging by and leaving me a nice note, Gail! Happy Holidays to you! I really love the vintage look of the watering cans. And I prefer the silver ribbon. Funny, I’m using those exact same Dollar Store snowflakes around my house in a number of Christmas projects! I decided to go with the less showy silver myself, Kathleen. It matches the silver-gray of the watering cans so well. Those little snowflakes are pretty nifty for lots of uses! That’s what I decided too, Chris! The red looked a little too overpowering to me. That is darling! I love the nostalgic feeling you get from your vintage finds! Love the watering cans in the window box. Love the colors -everything looks so beautiful! Thanks, FruGirls! Trying to keep it natural and just use the greens from our property! Darling! What a totally cool idea! Thanks, Jill! I like rustic and to use what’s on hand! Oh Barb… what a charming idea! 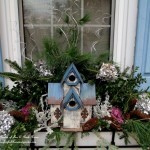 Never thought to create a Christmas window box! LOVE this! Pinned! Thanks so much, Donna! I’ll leave this windowbox up most of the winter now – so it is an all-purpose winter windowbox! How lovely! I love window box, wish I could make one, but are home has windows to the ground. It’s crazy. Maybe you’ll just have to put those windowboxes on the ground, Vanessa! No rules! I have one of those cans that I just put away in my shed! You’ve inspired me to incorporate it into our winter decor! I’m a first-time visitor to your site – I look forward to reading more. My husband and I are trying to build up the plants in our backyard and I think your site will give us some ideas. So glad you stopped by, Kristen! I hope you’ll come back and visit often for plant and garden tips and ideas! 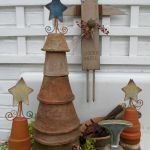 How did you get the finish on your watering cans? Did you use a sander? Thanks! The “finish” is just aged galvanized metal, Karin. All these cans are quite old and weathered and, with age, they develop a lovely soft patina.